Read any business paper section of a blog, and you'll probably find an article or two about crowdfunding. This or that company just raised millions of dollars for a special cause or to build a cool new gadget. But, what doesn't get written is what typically happens after the crowdfunding campaign ends. Does the product ship? Does it ship on time? Do customers and campaign backers like it? Does the company succeed? A paper from Ethan Mollick (University of Pennsylvania) and Venkat Kuppuswamy (University of North Carolina) analyzes multiple crowdfunding campaigns that raised money on sites like Kickstarter and Indiegogo and what happened to them afterward. The results are worth reading. In After the Campaign: Outcomes of Crowdfunding, the researchers surveyed over 2000 successful and unsuccessful campaigns that sought over $5000 crowdfunding in the Technology, Product Design, and Video Games categories. Successful crowdfunding campaigns did indeed launch projects ahead to become full-fledged companies (not just projects). The money raised via crowdfunding goes to hiring new employees and building firms with real revenues. Whereas startup companies might have turned to traditional sources of capital, the modern day startup geek and marketing mavens are turning more and more to crowdfunding. And crowdfunding is proving to be fertile ground for seeding companies. We found that reward-based crowdfunding can support more traditional entrepreneurship. A very high percentage (over 90%) of successful projects remained ongoing ventures. 32% of all these reported yearly revenues of over $100,000 a year since the Kickstarter campaign. Oculus Rift is a virtual reality headset that ran a very successful crowdfunding campaign on Kickstarter in 2012. About 9500 backers contributed almost $2.5 million to make the technology campaign one of the most successful crowdfunding projects at the time. In March 2014, Facebook announced that it would acquire Oculus for $400+ million dollars. Given its early success crowdfunding, Oculus is a pretty good example of a company that used this novel form of financing, crowdfunding, to launch as a "real" company. There are now numerous examples of companies turning to crowdfunding to raise their first monies on the path to growing larger, more prosperous enterprises. What&apos;s an Entrepreneur to Do With This Info? 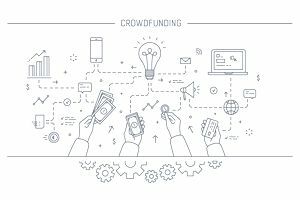 This study by Mollick and Kuppuswamy shows that for an entrepreneur, crowdfunding is an amazing way to launch a product and eventually, a full-blown company. For creators seeking funding, there is some clear advice from this study. Projects that are better prepared in terms of business plans and schedules are more likely to gain benefits and deliver on time. Outside endorsements and having appropriate backgrounds is also helpful. Bigger projects are less likely to be funded, but have more benefits when they are. Additionally, some of the factors found to lead to successful fundraising (having many Facebook friends, being featured by Kickstarter), were less useful in getting long-term benefits from Kickstarter.